Happy Saint Patrick’s day friends. Odd ball items can be found anywhere. But, here is a collection of photos I don’t think I have shared yet. 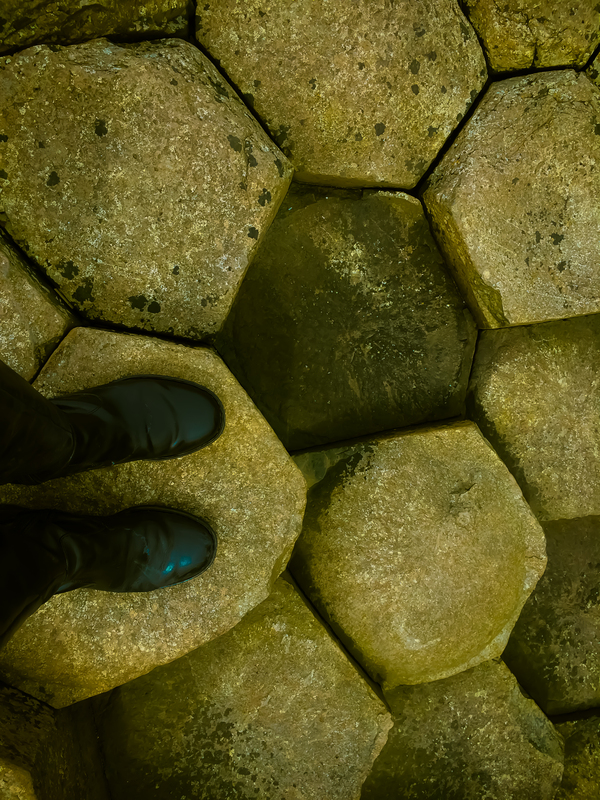 Check out the off ball side of Ireland for Cee’s photo challenge! Large Building full of “stuffed” animals. This deer lived a long time ago and was massive! To see some of my other photo challenges click here. 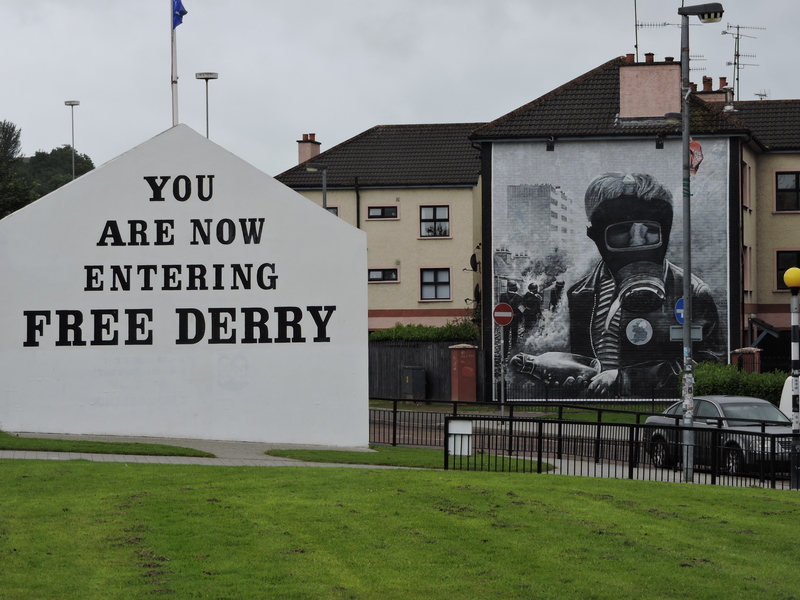 Depending on where you stand in Irish Politics you refer to the city as Londonderry or Derry. 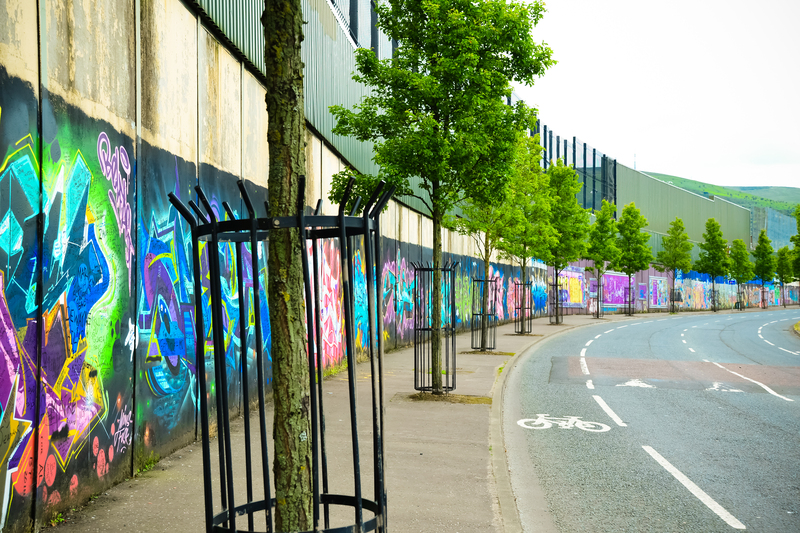 In fact, as one drives towards the city, one will see spray paint riddled signs blocking out the word London to display only Derry. 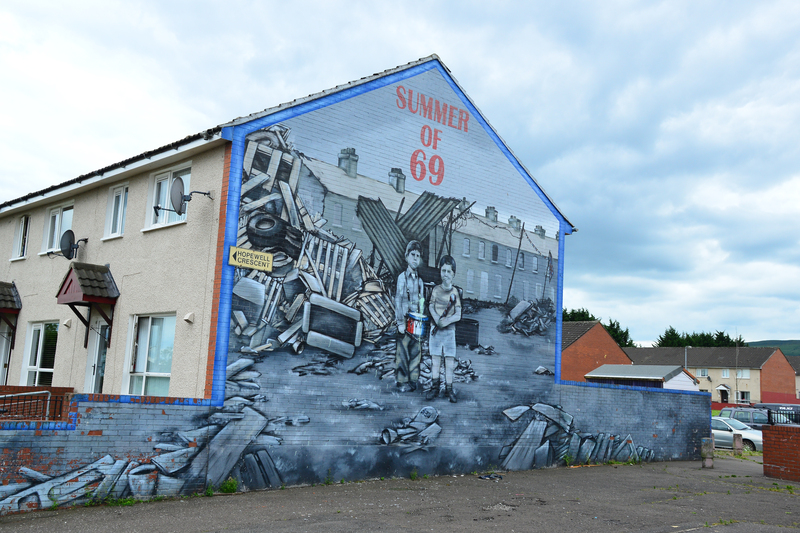 It seems Londonderry has similar issues as portions of Belfast. 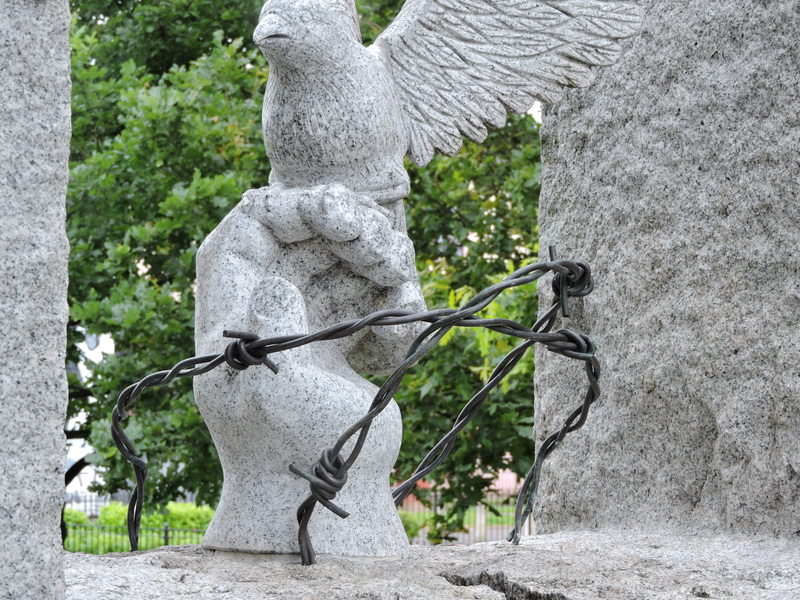 (See my Tour of a Lifetime post about the Belfast Troubles.) 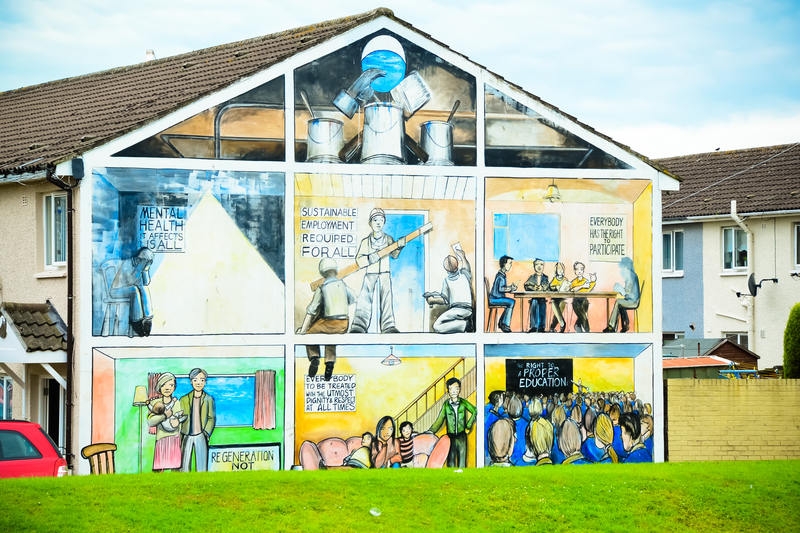 Murals depict the troubles front and center which I found beautiful and unsettling all at the same time. I can’t help but send light and good thoughts to the beautiful Irish people to find peace in their hearts for future generations. Irish Kitchen Painting Challenge – Which do you prefer? 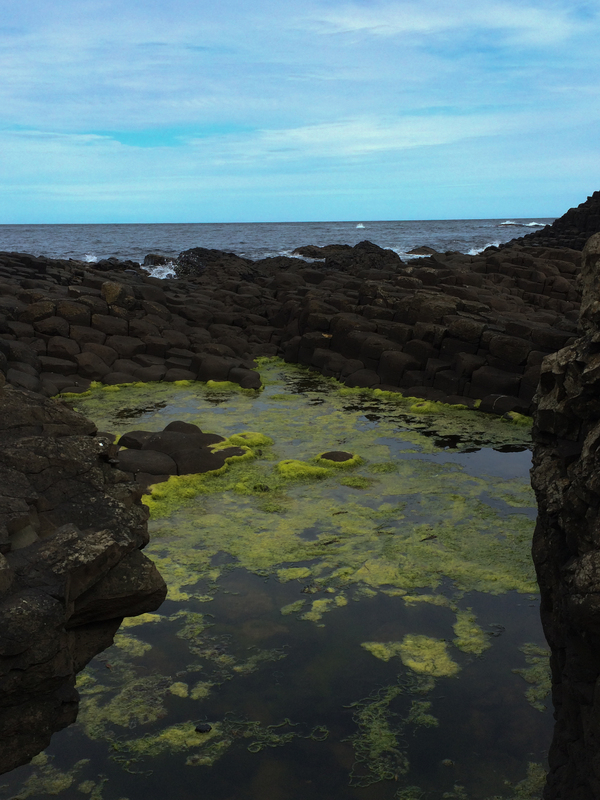 As has been obvious in my recent blogging I visited Ireland this summer with my parents and brother and his family. My husband was unable to join us. He did, however, send me to Ireland with a challenge. We currently have a simple little painting in our kitchen that depicts a cafe scene somewhere in make-believe Italy. He asked me to take a photo of a cafe or restaurant or bar in Ireland that could be put on canvas and replace the generic Italy scene we have now. Tell me your thoughts!? So far he can’t decide. I know which one I like but I am looking for outside opinions…which photo would you like to stare at every morning making coffee or every night cooking up a meal? 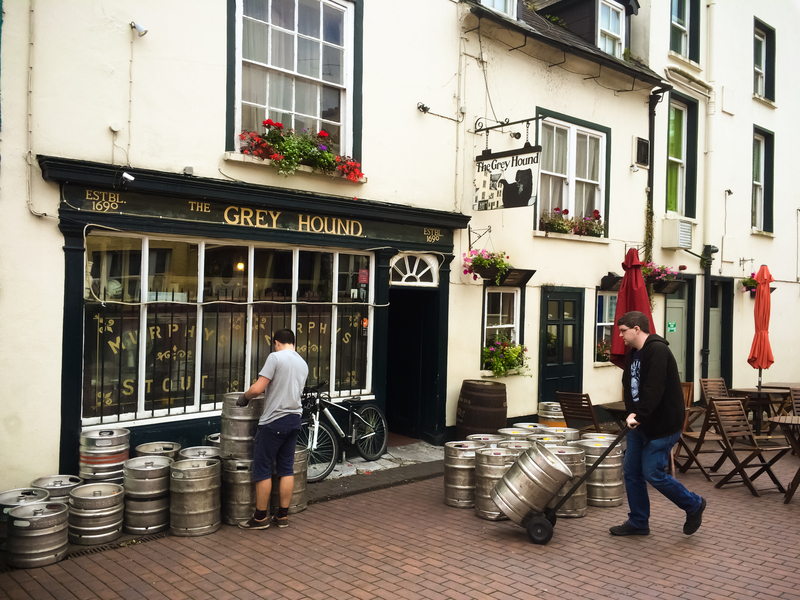 Charming bar scene in Kinsale? 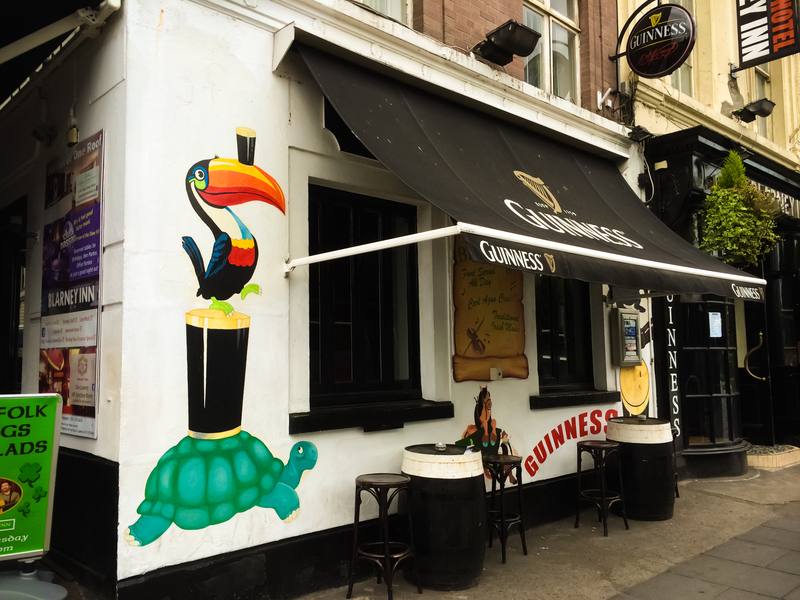 Silly happy little bar in Dublin? 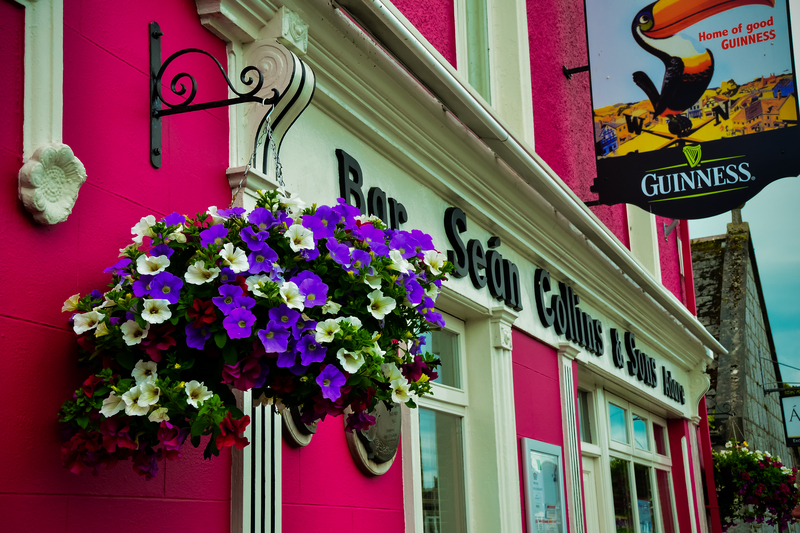 Brightly colored bar, strangely enough named after my brother, in Adare? 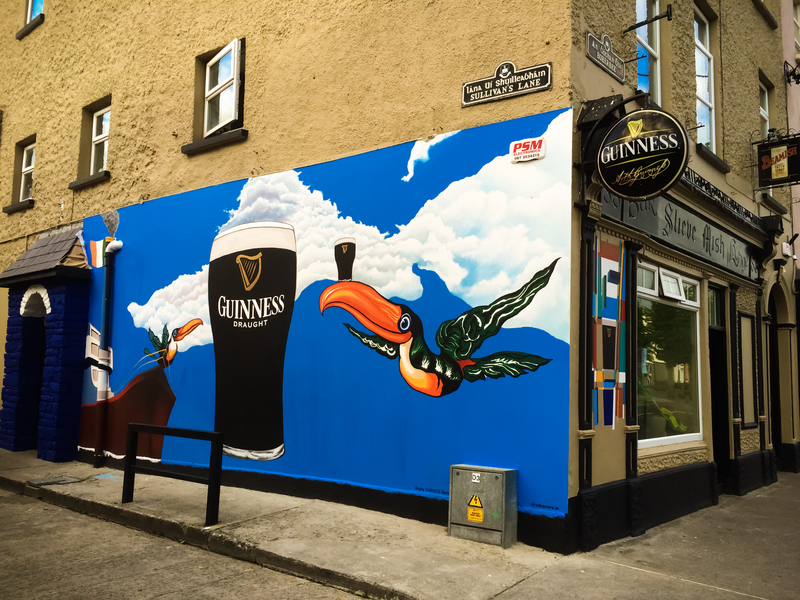 Bright Guinness mural from Tralee? 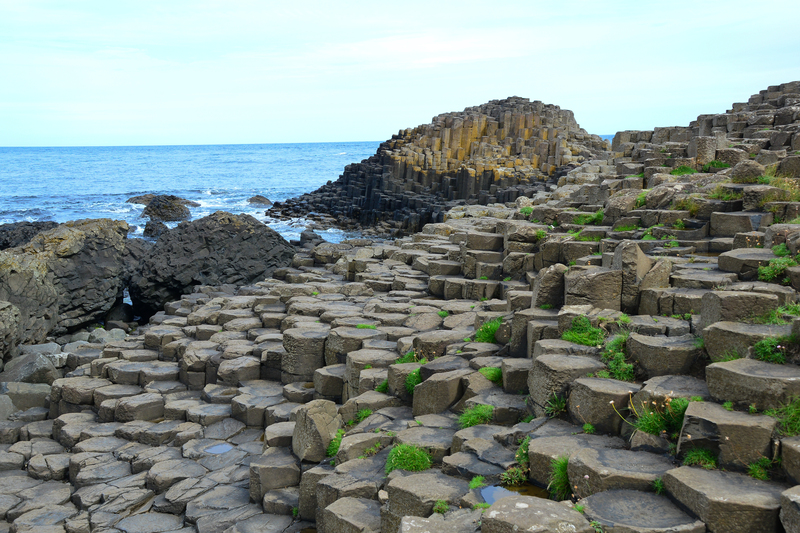 The causeway is a geological marvel found only in a handful of places in the world. (I am lucky to live near one of them called The Devil’s Postpile near Mono Lake.) 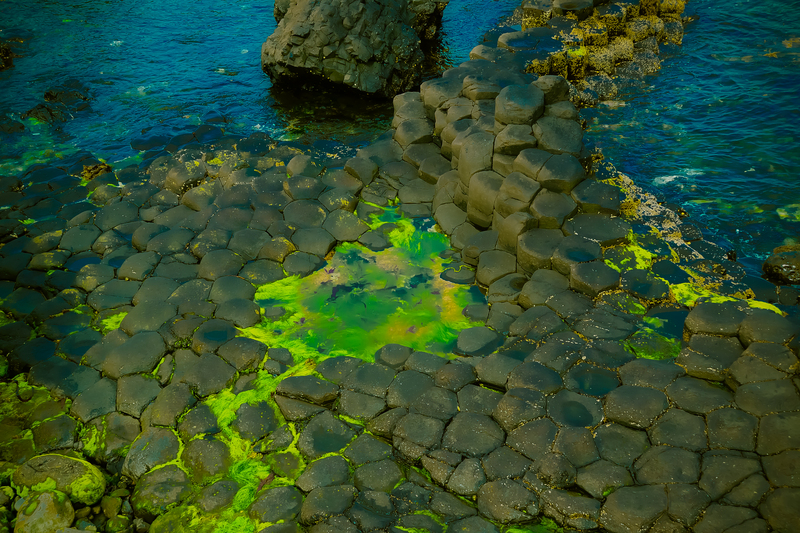 The volcanic cooling created octagonal shaped stones that provide a “causeway” from Ireland to Scotland under the sea. 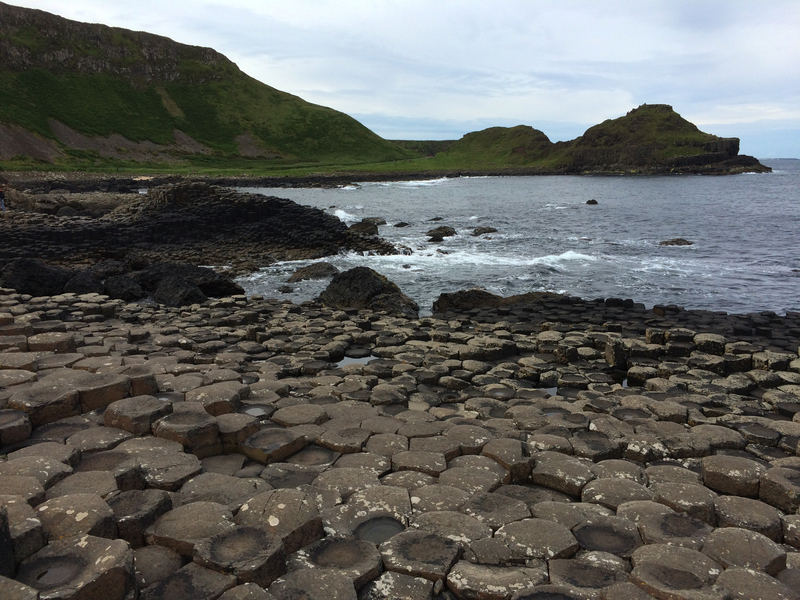 It is said the giant Fin McCool once created this causeway by stomping his feet. 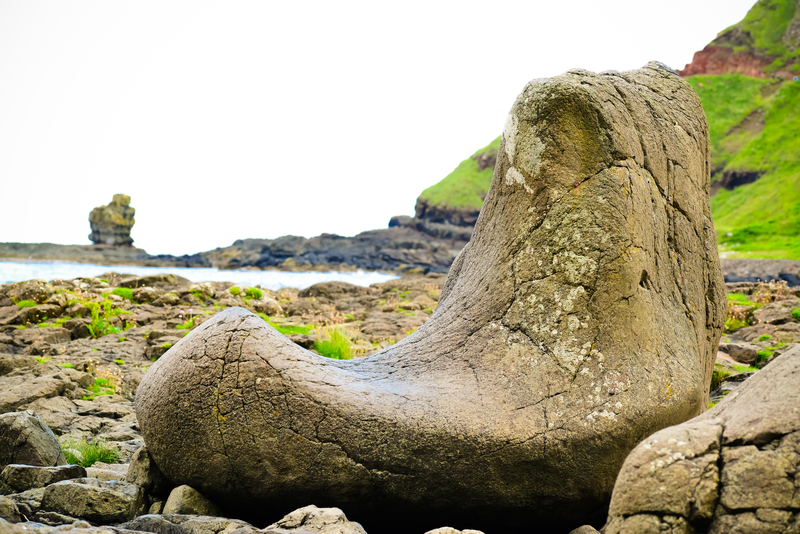 It was also the roadway that led Scotland’s giant to come knocking on Fin’s door. 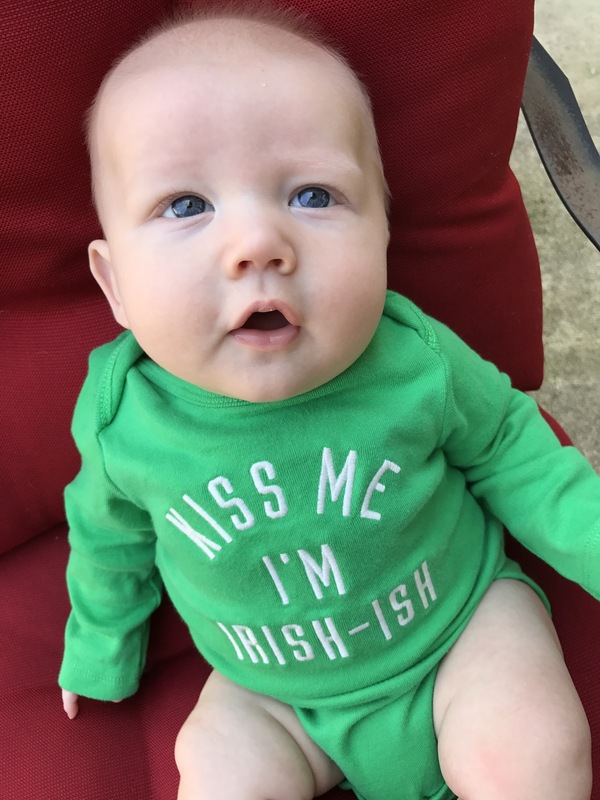 Luckily for the Irish Fin’s quick thinking wife dressed him up in baby clothes and put him in a baby carriage. She served tea to the Scottish giant and told him Fin’s father would be home soon. Seeing the size of the giant baby the Scottish giant fled home thinking the father must be 10 times larger! 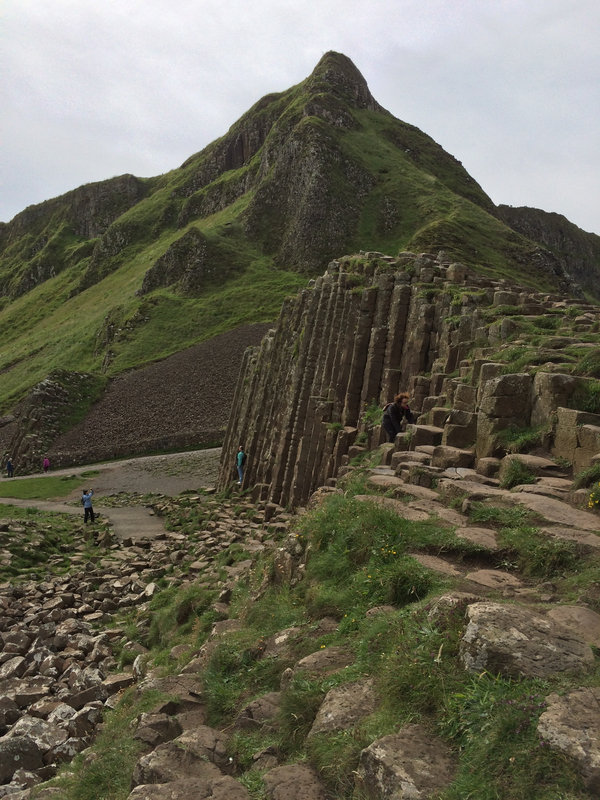 Giant’s causeway is situated on the sea with a view of Scotland on a clear day and the Norther island peninsulas. 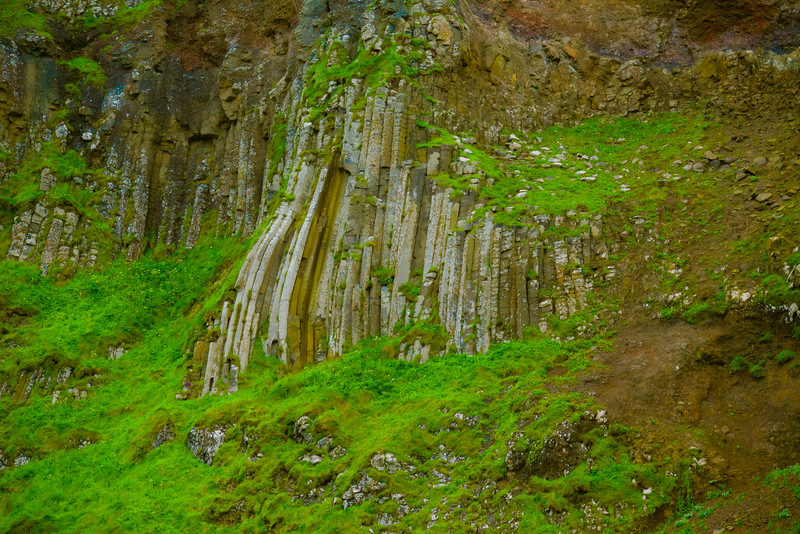 The causeway road will also drive you along arguably some of the most painfully gorgeous scenery in the world. We were lucky to have a clear bright sunny day leaving me to think that life, in that moment, could not possibly be any better. 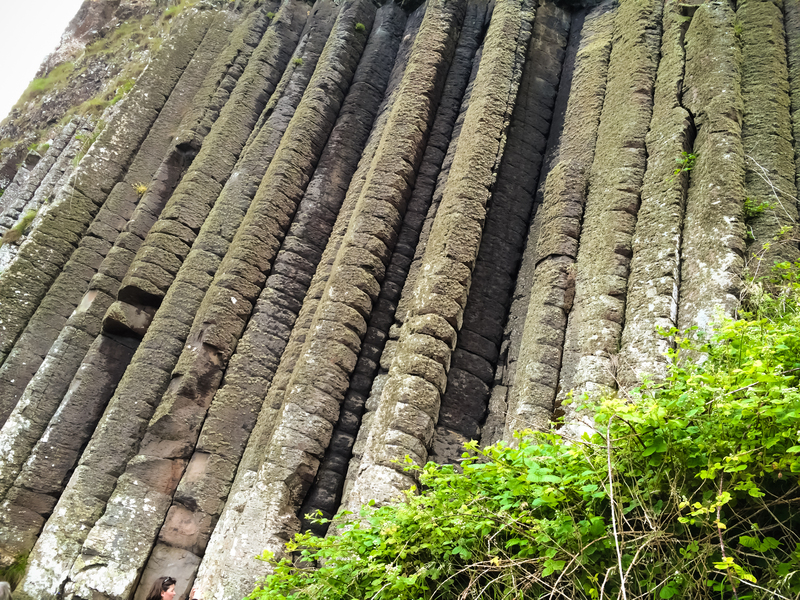 Spend the rest of your day visiting Bushmills, Dunluce Castle, Portrush, Carrick-a-Reed rope bridge, and maybe even Dark Hedges. My favorite thing to do though is to just meander along the Causeway highway and see where the road takes you. Because, wherever it takes you I guarantee you will enjoy it. 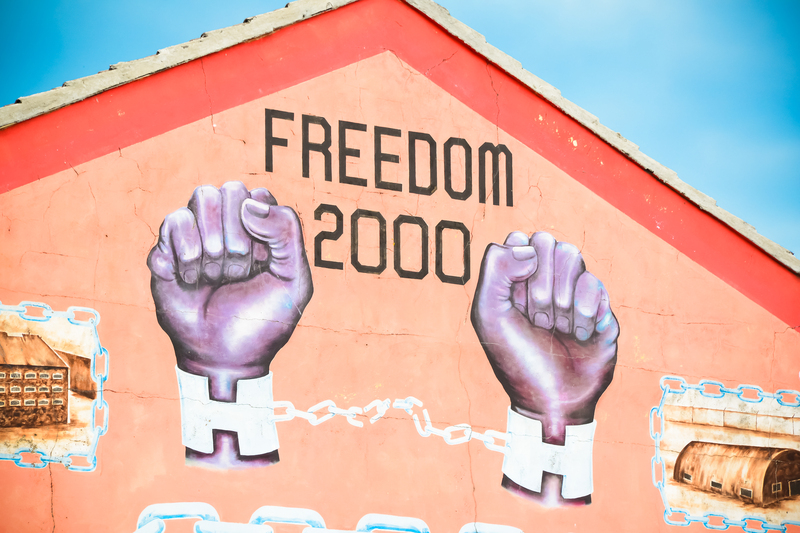 I last visited Belfast in 1999. Things were different then. I remember pipe bombs going off making a young me a little nervous while I was there for the day. 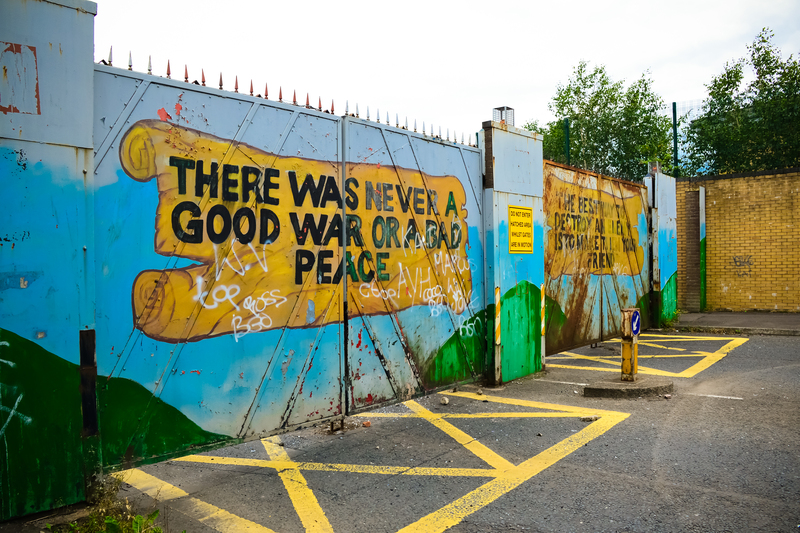 Since then the Good Friday agreement and several other actions have taken place to ensure peace in Northern Ireland. Or so I thought. 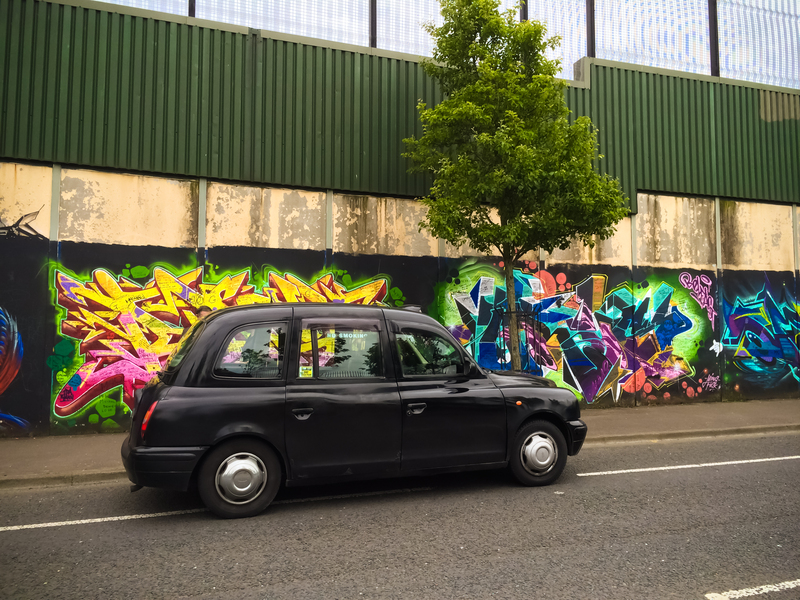 While in Belfast recently for the day we decided to do something a little different by skipping the standard city tour instead taking a Paddy Campbell’s Black Cab “Political Tour.” Danny was our guide, a local who grew up in the 70’s right smack dab in the middle of the troubles. To be honest I don’t know where to start. 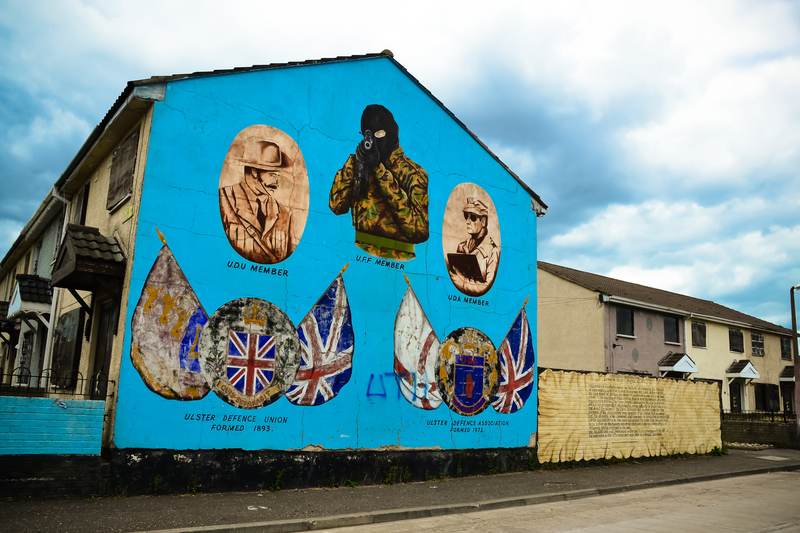 I don’t want to put anyone off of Belfast and certainly not Northern Ireland because I sincerely cannot recommend them highly enough. But along with the good I believe one must understand the history of the location they are traveling to if they want to better understand it. 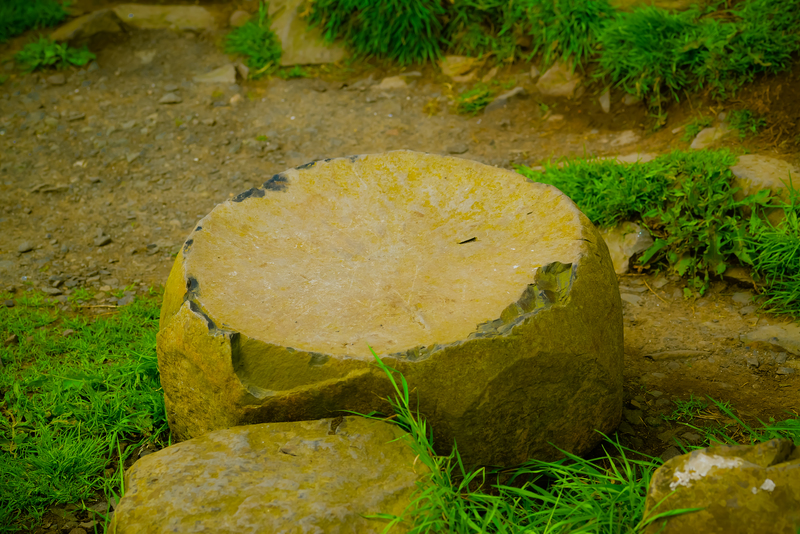 Where the troubles started could be argued. 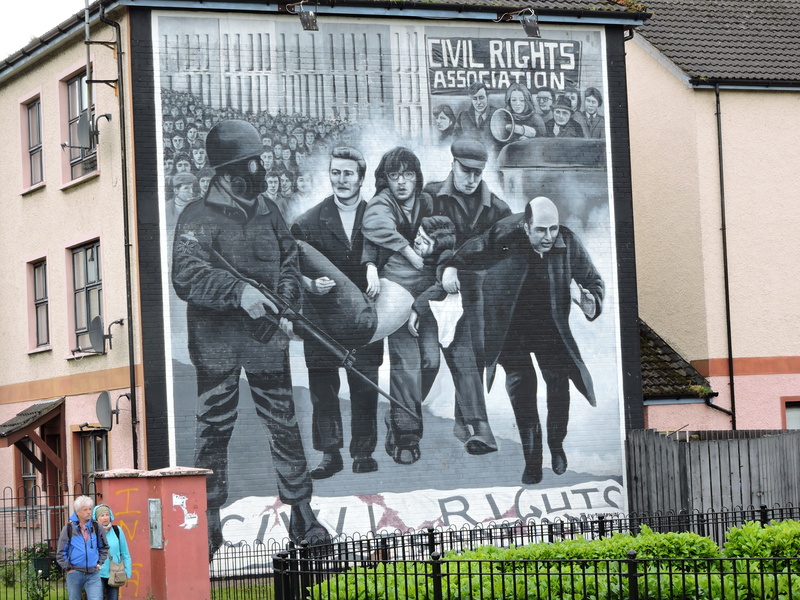 Did it start in the 60’s when Catholics weren’t allowed the same housing and voting rights as the Protestants? Did it start with the Protestant William of Orange defeating the Papist James II at the Battle of the Boyne? Who knows? And it certainly isn’t for me to say. But, what I can tell you is that dissension is alive and well. It isn’t making the national news any more. Perhaps, because Northern Ireland is censoring the news? Or, Perhaps because the Irish want to be perceived as successful at their negotiating peace while others in the world are struggling? Again, I don’t know and I wouldn’t even begin to take a guess since I am only a visitor. 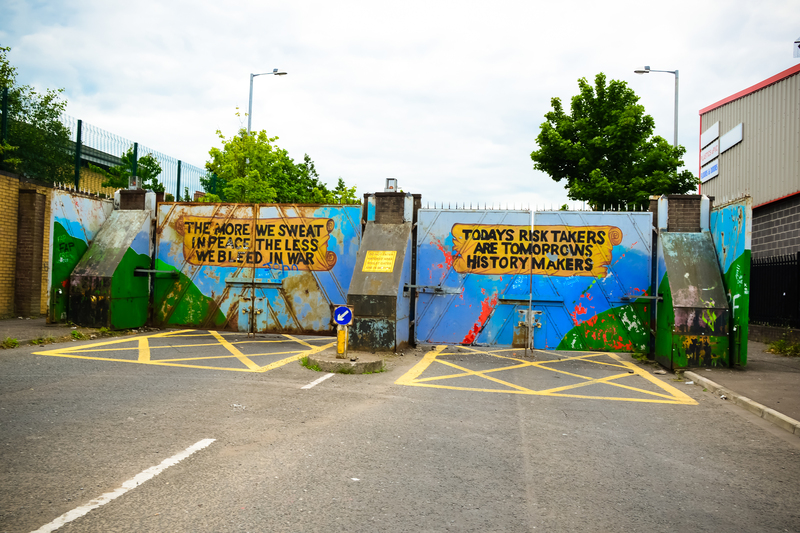 Danny took us around in his black cab to the Protestant Shankhill Road and the Catholic Falls Road area which are still divided by a military style locked gate. It was “marching season” just after July 12th where the Protestants take to the streets marching through the Catholic areas with anti-nationalism and anti-Catholic sentiment. Violence had ensued just days before we visited so many of the gates were still locked much to the frustration of the pedestrian and motoring public. 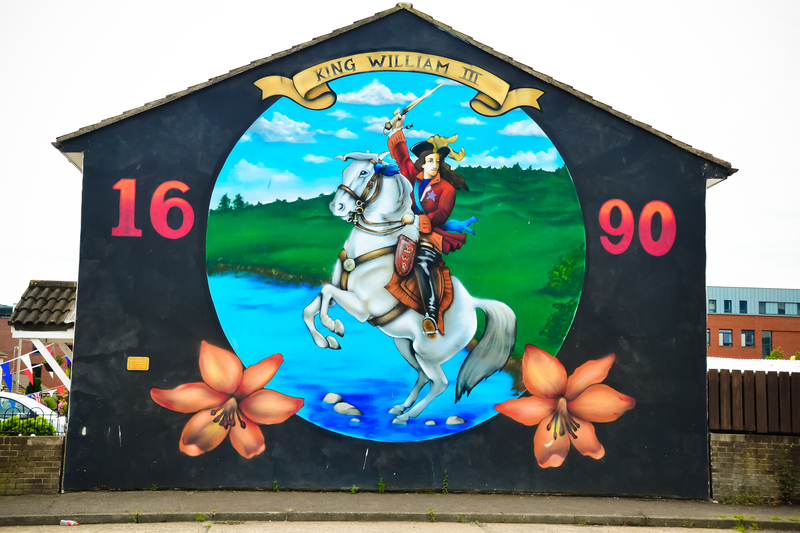 In the Shankhill area we were driven by and walked through the housing areas to view magnificent murals created to memorialize William of Orange, historical events that had taken place, and in many cases those who terrorized Catholics since the 70s. For example, one mural sensationalized Stevie “Top Gun” McKeag, a violent murderer, for brutally killing a large number of Catholics. 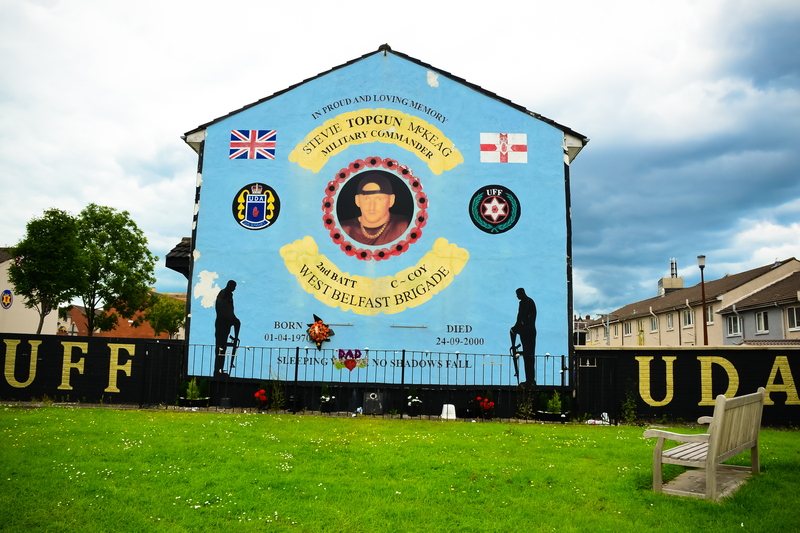 Protestant “Top Gun” was responsible for murdering numerous people including a young Catholic female pharmacy student who walked only feet from her store on the Catholic side to the Protestant side to deliver medicine to an elderly Protestant man. Remnants of a bon fire the night before. Bon fires dot the landscape during marching season. 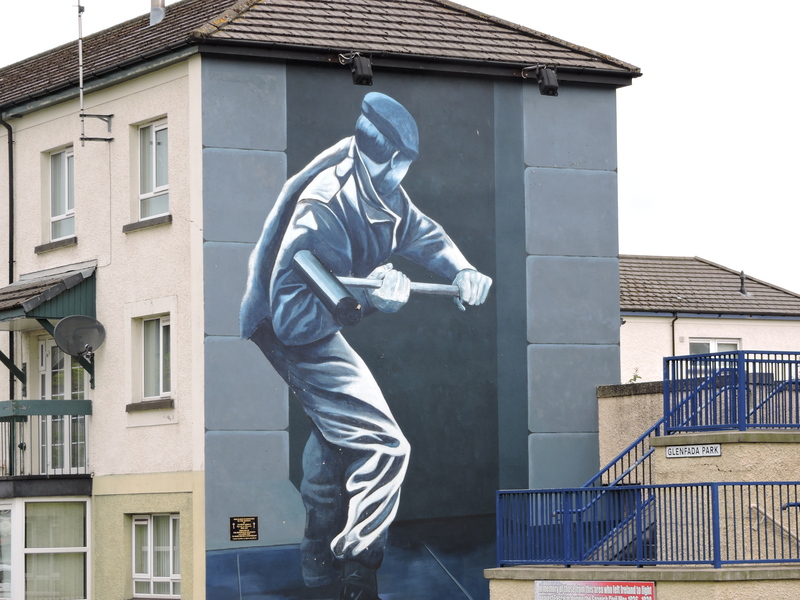 Conversely on the Catholic side an equal number of murals exist rather the subject matter is not of those who were successful in violence against the other side but they highlight those who were killed or martyred during the conflicts. 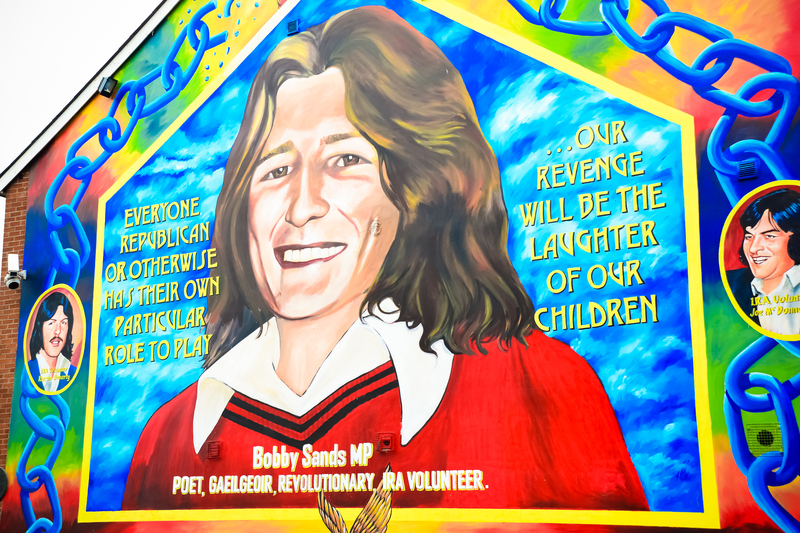 Bobby Sands is likely the most famous of those Catholics who died as a result of a hunger strike taken, while in prison, which brought a lot of recruitment and notoriety to the efforts. 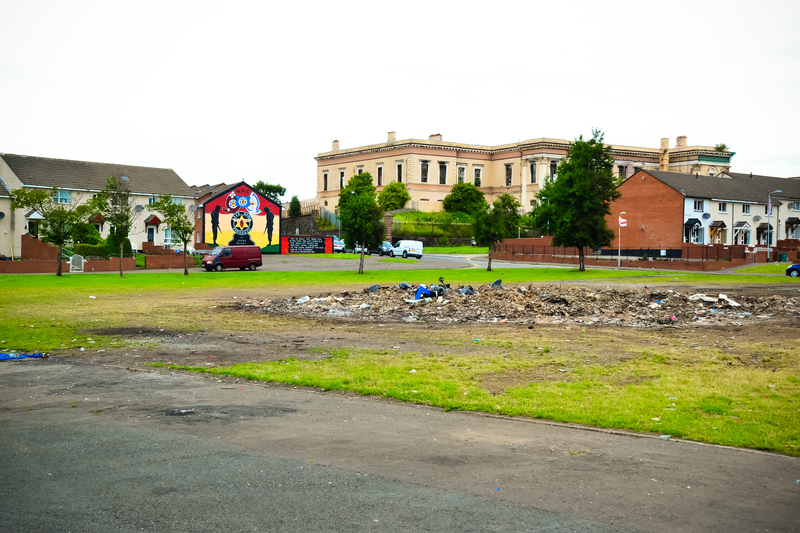 Instead of bon fires meant to intimidate they choose to erect Peace Gardens in each of the neighborhoods depicting each person killed as part of the conflict. Today, I am told it is less about Catholic and Protestant and more about British rule versus Irish independence. Since 1949, the majority twenty-six southern counties fall within the independent country of Ireland and six Ulster counties remain in Northern Ireland as part of the Queen’s empire. Some of the Loyalists view the Republic as traitors while those in the Republic have fought merely for their freedom and Independence. 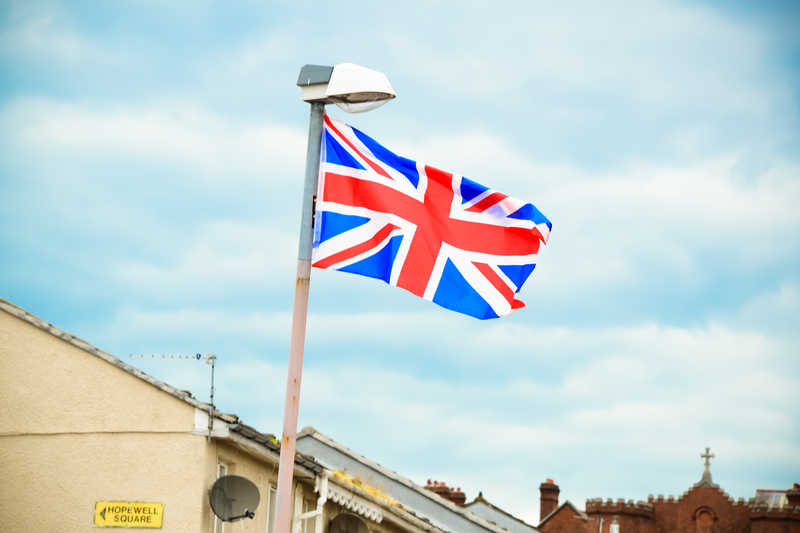 It was against the law only until recently to fly an Irish flag in Northern Ireland. And even today I never saw a single Irish flag in Northern Ireland only scores and scores of British Flags. Where traffic signs are duplicated in both English and Irish in the south many in the north see speaking Irish as treasonous. 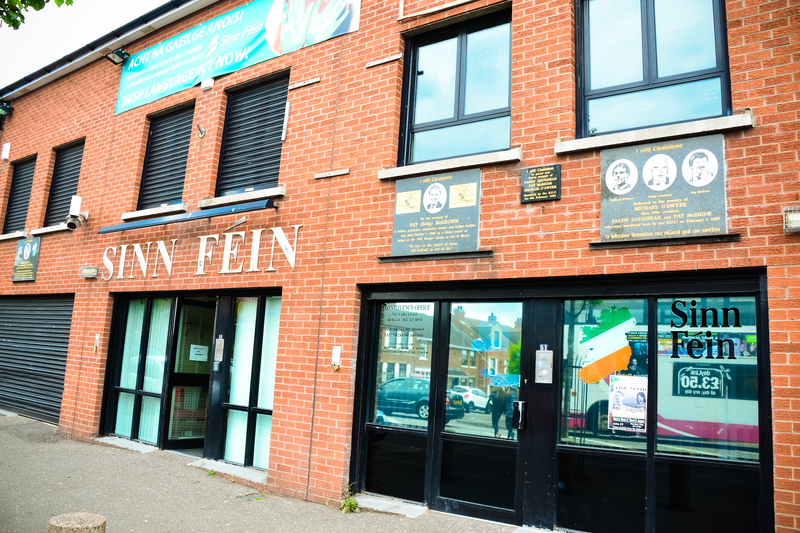 Many welcome both Protestants and Catholics in to their homes while those who hold fast to the Orange Order are not allowed to marry or fraternize with Catholics. Danny drove us to the famous peace wall, a starkly long and artistically graffiti’d wall that’s mere presence is an oxymoron. 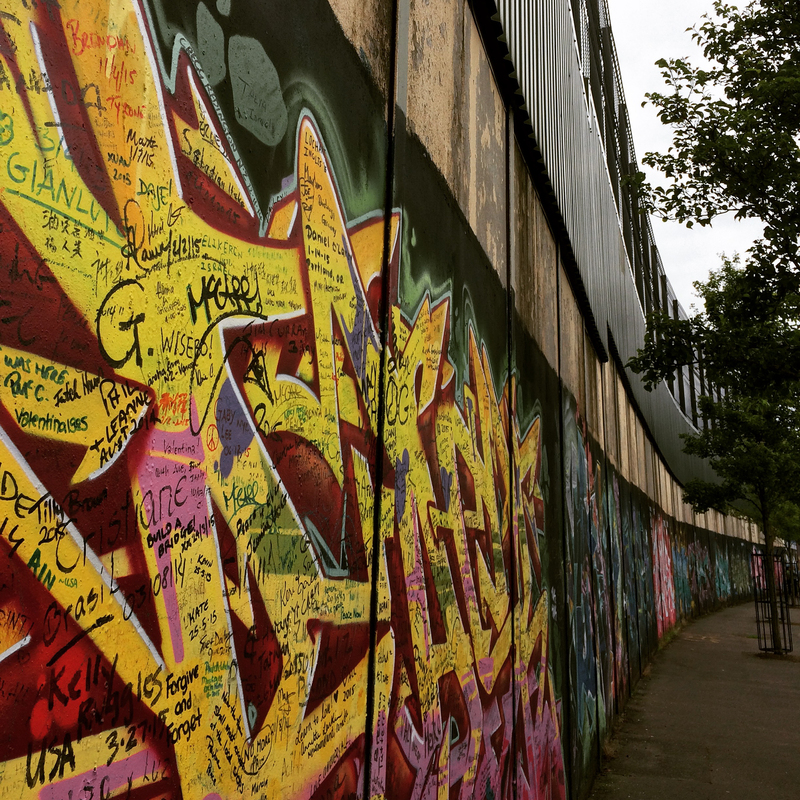 The very wall where millions of people have signed their names and sentiments of peace and love, even President Obama on his recent visit, is actually affixed to the very wall that to this day separates Protestants from Catholics. The wall is higher than twenty feat with razor wire at the top. It butts up mere feet from the back of Catholic houses. It is a daily reminder for those who travel back and forth and in between that peace is possible. When the tour was over, I felt enlightened and frustrated all at the same time. I couldn’t believe this was still happening to this level and it wasn’t making the national news. Mind you these sentiments are particularly high in these areas of Belfast and LondonDerry and not as heightened elsewhere in the North. But, as we were walking back to the car together I made the statement to my dad that I knew one thing for sure…I knew where our driver was from. 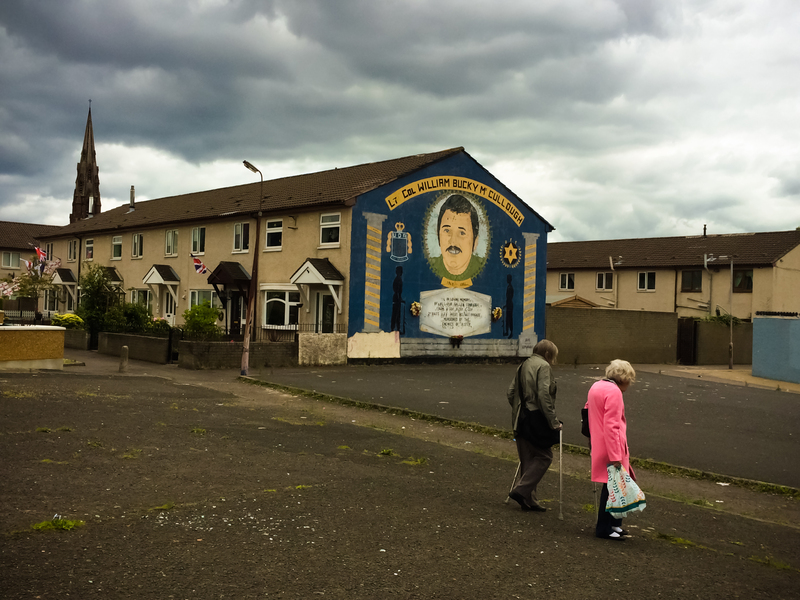 The driver Danny had never told us if he was Catholic or Protestant. My Dad agreed with me and said he was confident he knew as well. My mother asked us which side, Protestant or Catholic? We replied at the same time…one Protestant and one Catholic. Neither of us agreed! 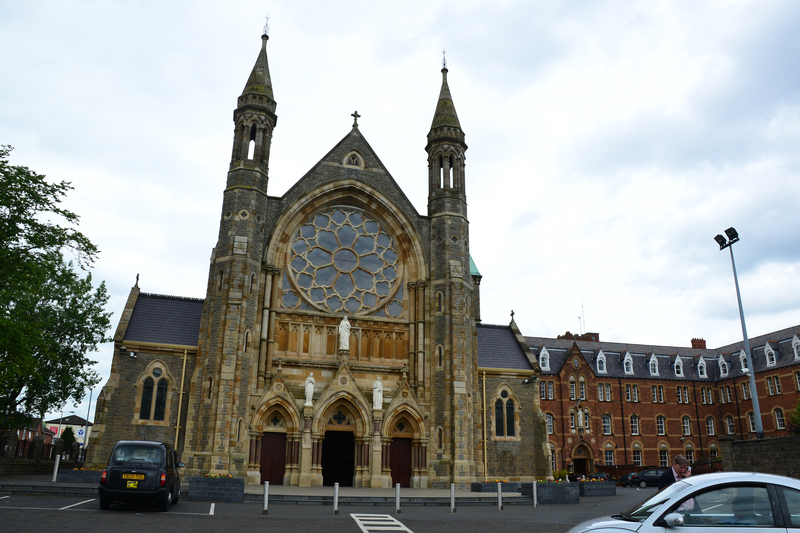 Clonard Monastary known for its desire for peaceful mediation of the situation that immediately surrounds it. I cannot recommend this tour highly enough. It was not glamorous and at times it was unsettling. But, I feel enlightened and better for the knowing of it. 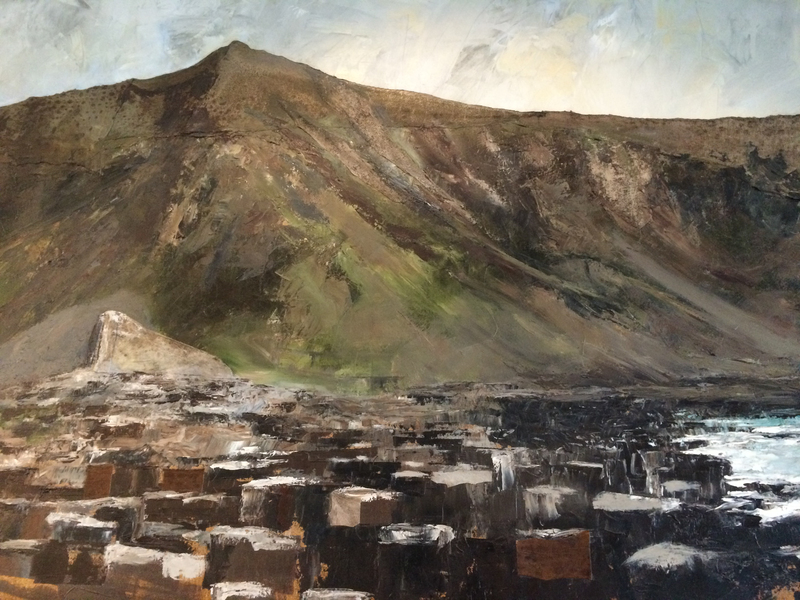 For more on my Ireland trips please click here! While planning our Ireland trip with my parents I knew I wanted to take them to Northern Ireland. I hadn’t been to the North since I visited with my brother approximately fourteen years ago. 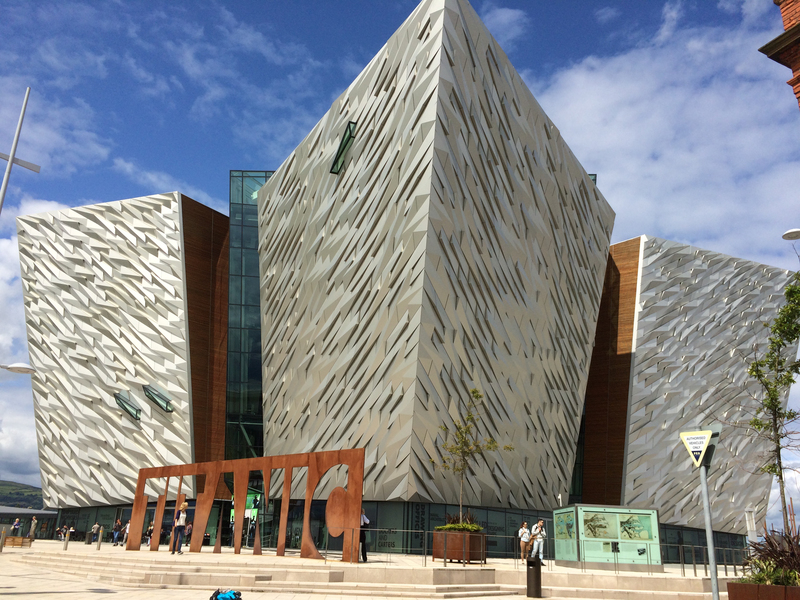 I had a few must see items on the list but The Titanic Museum kept creeping up in my travel books and online. It’s a reasonably new museum one, to be honest, I didn’t have much interest in seeing. I figured I had seen all I needed to see of it from watching the Leonardo DiCaprio movie and a few documentaries on TV over the years. Andrew Petcher from Have Bag, Will Travel recommended it SO highly that I gave it another thought. I knew we would be passing through Belfast on our way to the far North and figured it might be a nice place to stop one my parents might also enjoy. Thanks Andrew for the recommendation because all three of us really enjoyed it! 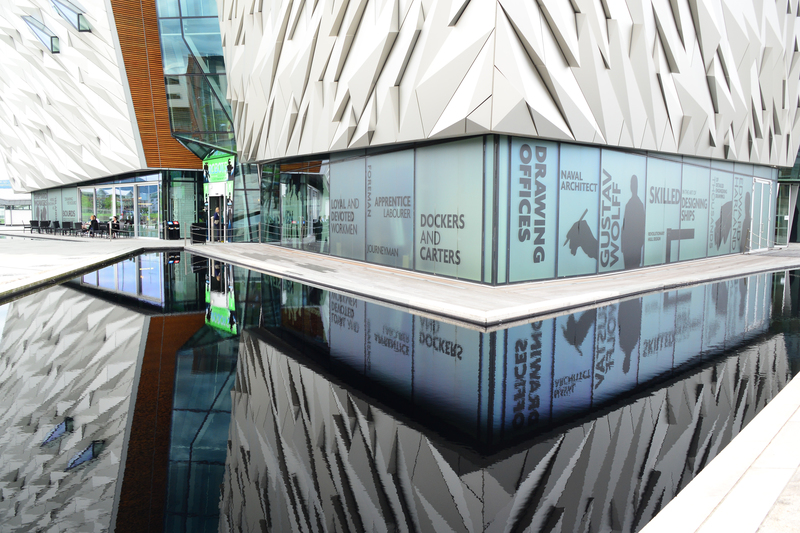 The museum is located on the grounds of the actual shipbuilding yard the Titanic was created on. 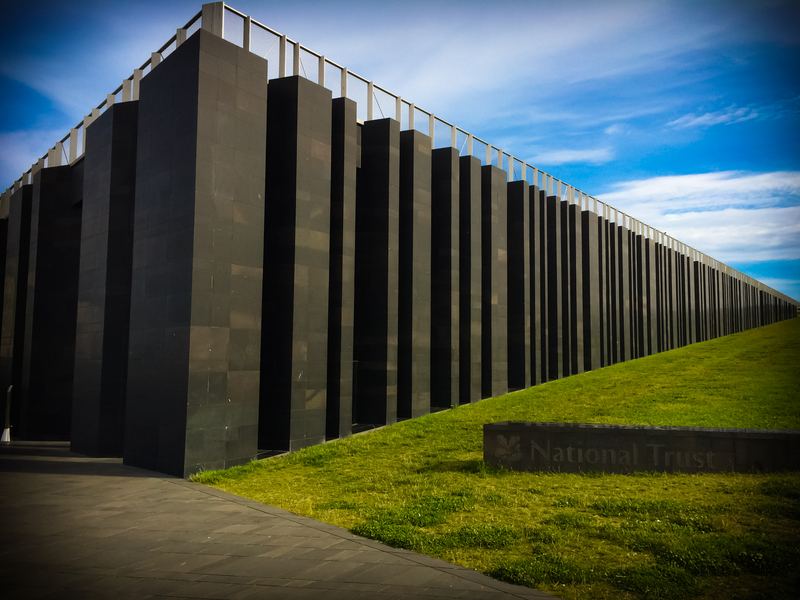 The museum building is an architectural masterpiece mimicking the lines of the ill-fated ship. It is surrounded by a pool that mirrors the beautiful lines and bright silver exterior. 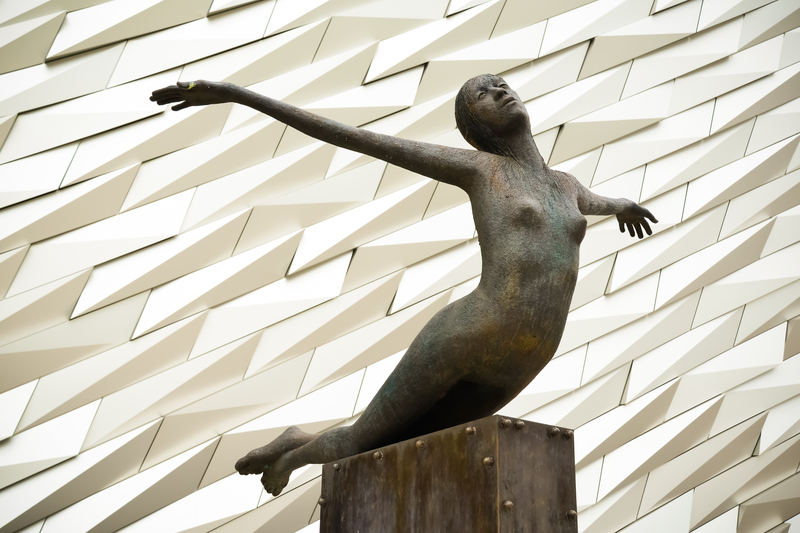 The front of the building has a very cool and very large Titanic sign framing a stunning feminine sculpture. 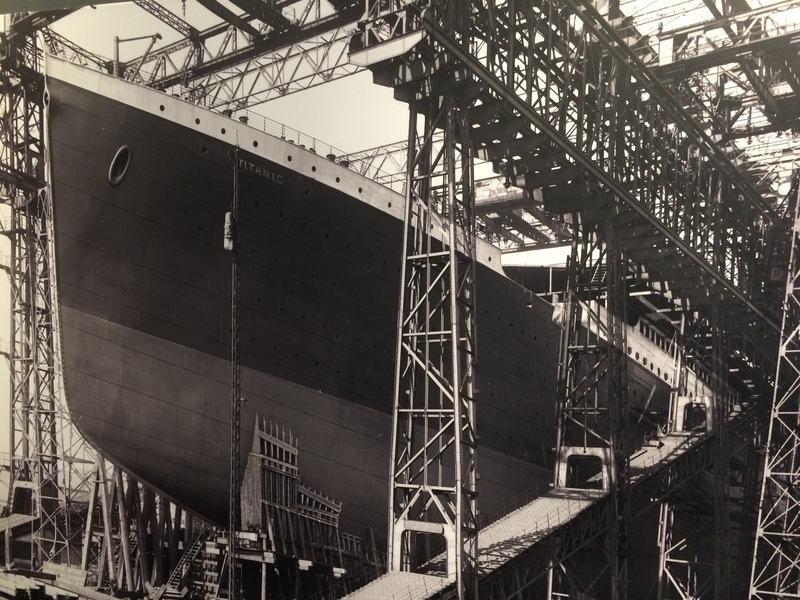 The museum describes throughout each exhibit people associated with the Titanic from those who built the ship, to those who worked on the ship, those that purchased tickets, and those who helped rescue passengers. This small and unassuming sequence of displays really makes the visitor connect with the human aspect of the tragedy in a way that is easy to ignore when we see or hear about the ship now. Next, visitors can see the interiors of all of the rooms of the Titanic with recreations of the actual furniture, ceramics, silverware, textiles, clothing, etc. It was enjoyable to see the difference in the large staterooms versus the smaller rooms shared by lowers class passengers and employees. Later the museum moves in to the accident and its response. It highlights the heroes and rescuers who saved many lives and those who were cowards and saved themselves while they let women and children die. 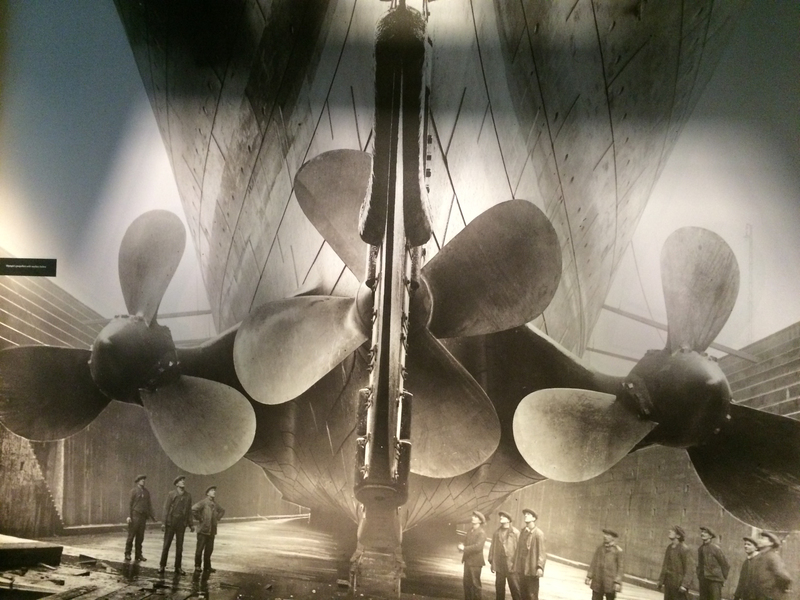 The museum had another section on the discovery of the Titanic ship wreck and the technology required to find it. It even simulates, via video in the floor, the actual shipwreck as it looks today if you were floating over it in a glass bottomed submarine. 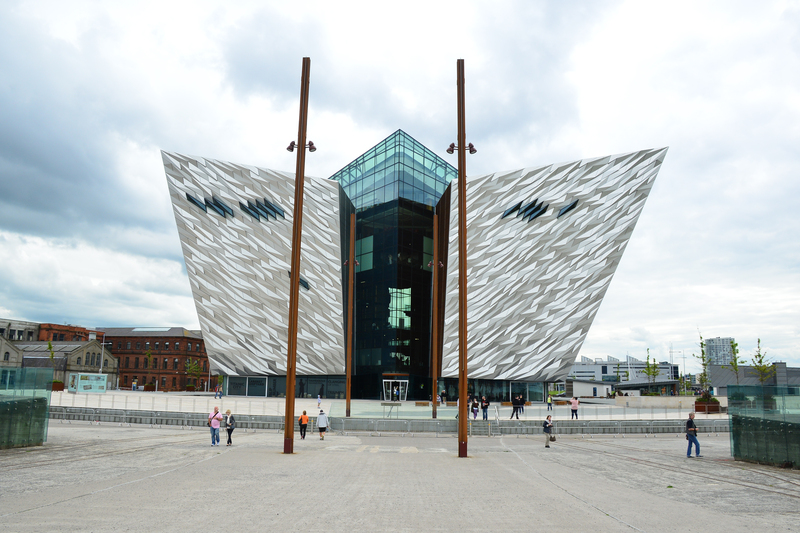 Finally, the museum focuses on the pop culture of the Titanic and its music, literature, theater, and movie history. You can be certain Celine Dion is belting out her tune probably much to the dismay of the staff who works there and listens to it over and over to the point of insanity. 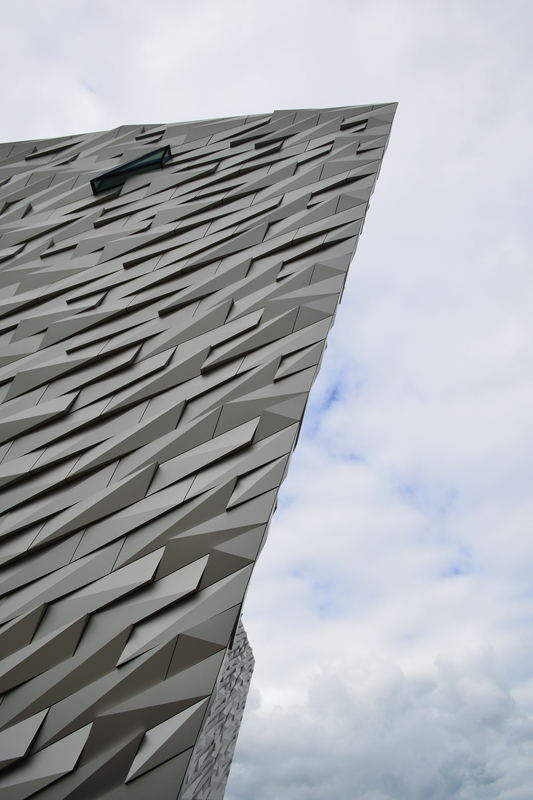 This top rate museum does a fantastic job of exploring every single aspect of the Titanic from before it was built all the way to today. They do it in an interactive and interesting way where the visitor’s interest never wanes for a moment. I couldn’t recommend this museum more. As my mother put it, “This is the best museum I have ever been to!” Take it from my Mom because that is big talk. While motoring through a place I often find myself looking for interesting places to “stop along the way.” I scheduled a lot of driving in our most recent Ireland trip and needed a break to get out and stretch. Andrew with Have Bag, Will Travel suggested visiting Dark Hedges if I happen to be in the area. 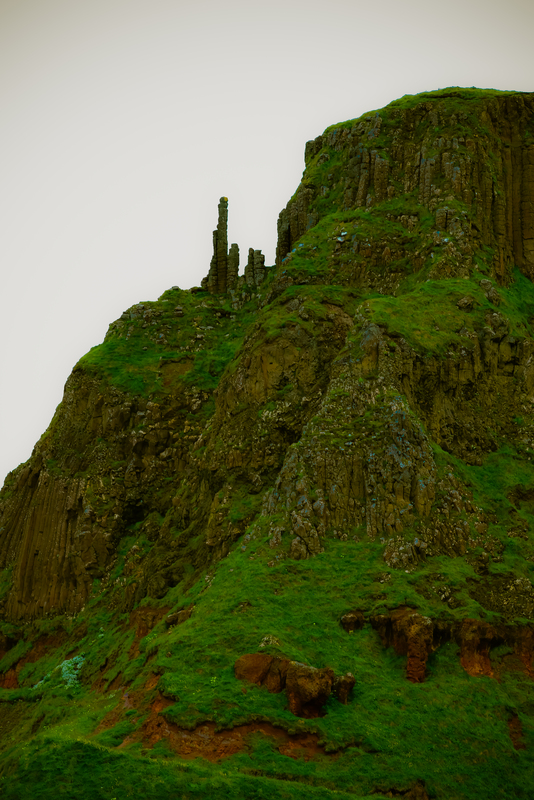 It seems this location is one of many Game of Thrones filming locations in the area. Well, with a slight detour, we traveled through Ballycastle, Northern Ireland and took a stop at the Hedges. Gracehill House is a Georgian Mansion built by the Stuart family in the 18th century. Beech Trees were planted along the approach to the house as a way to impress visitors. The trees are mesmerizing and stunning in a simplistic sort of way. No grand gardens were required here. Just magical and seriously impressive trees growing over one another begging people to walk down their path. I have always been drawn to tree lines driveways in Ireland, the American South, and anywhere the home owners have the patience and forethought to plant something they may not have the lifespan to fully enjoy. I am grateful for the Stuarts to think of me, who might, two hundred years later still enjoy the spoils of their efforts. I’m not kidding when I say I was so taken by this place we barely noticed the actual Georgian Mansion the trees led visitors to. 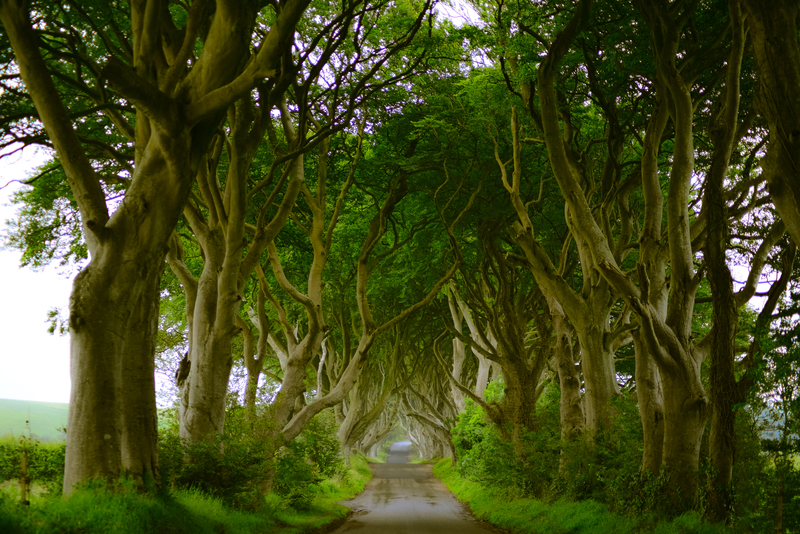 The Dark Hedges are located along Bregagh Road, near Gracehill Golf Club, off the A147, approximately 2.5 miles from the village of Stranocum heading north. *I also submit this entry to Cee’s Which Way Challenge!